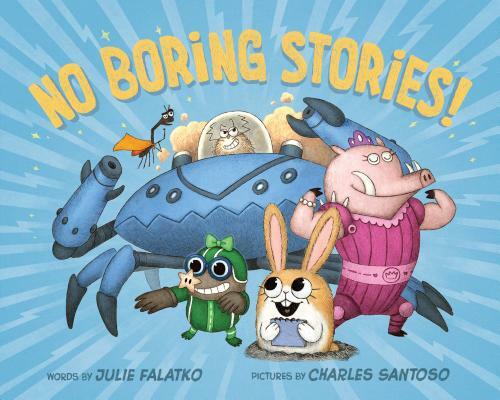 A group of misfits takes a stand against sweet, cuddly, boring stories in this picture book by the critically acclaimed author of the Snappsy the Alligator series, Julie Falatko. The unpopular animals have had enough. They want to be in a picture book! Stories about mommy-loving kitties and cuddly bunnies at bedtime are boring. Wouldn't you rather hear about yeti crabs in robo suits and fierce babirusa princesses who fight giant grape monsters?! This group of misfits has a unique story to tell, but they'll never finish writing it if their over-eager bunny neighbor won't GO AWAY! Julie Falatko, critically acclaimed author of the Snappsy the Alligator books, brings her signature humor to this stand-alone picture book about finding your tribe and writing the stories you want to see, no matter how weird or wild they are! Julie Falatko loves to talk about books. She has a library science degree, is a frequent contributor to the Nerdy Book Club, was a picture book reviewer, and started a Little Free Library in front of her house to share books with neighbors. She is the author of two Snappsy the Alligator titles, as well as the forthcoming The Great Outdoors and the Two Dogs in a Trenchcoat series. Charles Santoso loves drawing little things in his little journal and dreaming about funny, wondrous stories. He has illustrated several picture books, including The Snurtch and I Don't Like Koala (both written by Sean Ferrell); Ida, Always (written by Caron Levis); and Peanut Butter & Brains (written by Joe McGee). Before children's books, Charles worked in animation. His illustrations have been exhibited in Sydney, Australia, and also internationally in North America and France. He currently lives and works in Sydney. Visit him at charlessantoso.com and follow him on Twitter @minitreehouse.